Celebrating decades of Pride by bringing colour to the streets. WHEN: Thursday, June 5, 6:30 p.m.
WHAT: Rainbow crosswalks installed in the Village in honour in WorldPride 2014. 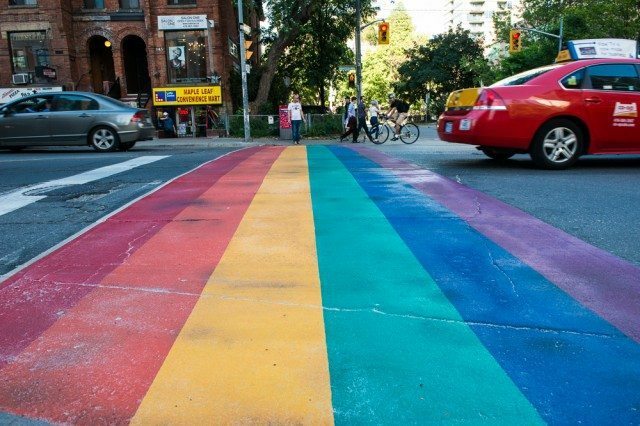 The vibrantly coloured crosswalks can be found at the intersections at Church and Alexander, and Church and Isabella, and they’ll be sticking around after official Pride celebrations wind down at the end of June. “Pride Toronto is thrilled that rainbow crosswalks will welcome visitors to WorldPride this summer, and will remain a permanent legacy of the event for years to come,” said Kevin Beaulieu, Executive Director of Pride Toronto, in a press release.